Isaiah King-Cruz/Contributing Photographer Sophomore outfielder Andrew Eng went 3-for-3 with five RBIs in Binghamton’s 16-4 win over Niagara on Saturday. 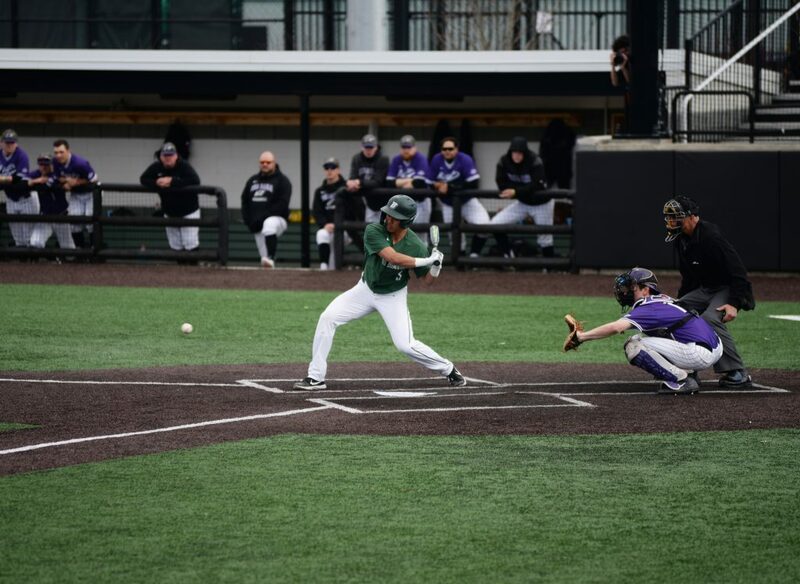 Following the cancellation of Friday’s game, the Binghamton baseball team participated in two games at home, one against Niagara and one against Central Connecticut State. Both games featured some of the best weather we have seen in Binghamton as of late, and some great ball play. On Saturday, the Bearcats (12-12, 3-2 America East) hosted the Niagara Purple Eagles. BU dominated, winning by a final score of 16-4. On Sunday, BU took on the Blue Devils of Central Connecticut (12-10, 4-3 Northeast Conference), earning itself a narrow victory, 3-2. Saturday’s game saw a strong performance from BU from start to finish. The Bearcats did not allow a single run for the first two innings and rallied for seven of their own. While the Purple Eagles (6-20, 2-4 Metro Atlantic Athletic Conference) were able to score a run during the third inning, Binghamton scored one as well and then added four more in the fourth. By the time the top of the fifth came around, the Bearcats had a 12-1 advantage. Niagara was unable to score again until the top of the ninth, at which point it recorded three runs to try and put itself in a position to come out on top. This, however, was just not enough to overcome the deficit, and the Bearcats ended the day with a lopsided victory, 16-4. Sophomore designated hitter Andrew Eng ended the game with five RBIs for the team, which he drove in on three hits, including his first home run of the season. Senior pitcher Nick Gallagher allowed just four hits and one run in five innings, striking out four batters. Gallagher was relieved by freshman pitcher Thomas Babalis, who kept the Purple Eagles to one hit in his three innings at the mound. Sunday’s game against the Blue Devils featured less offensive action than was seen on Saturday, with five runs scored by both teams combined. A scoreless streak was snapped by BU with a single from freshman infielder Zachary Taylor, whose hit allowed redshirt junior infielder Alex Baratta to make it home in the fourth. The Bearcats earned another run in the fifth and one more during the seventh via a single from sophomore outfielder Shane Marshall, which led to a run scored by sophomore infielder Jake Evans. Central Connecticut, with just one run earned in the fourth and fifth inning, proved unable to keep up. Junior pitcher Ben Anderson enjoyed the attention of MLB scouts in attendance on Sunday, striking out eight to raise his total strikeouts of the season to 57. Binghamton will return to the diamond on Tuesday when they travel to take on Cornell in a one-game slate. First pitch is scheduled for 3 p.m. from David F. Hoy Field in Ithaca, New York.